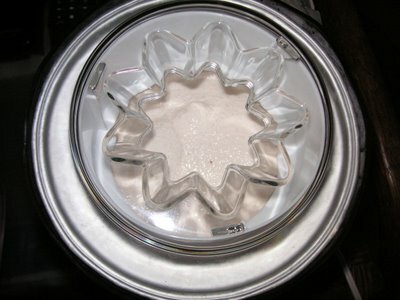 Edit: This is what it looks like after I melted the original batch and churned it the second time. It's a deeper pink because during the melting and churning process, the strawberry pieces were "cut" smaller, so more of the red got into the mixture. It's much softer than before, although I still should have let it churn for longer. 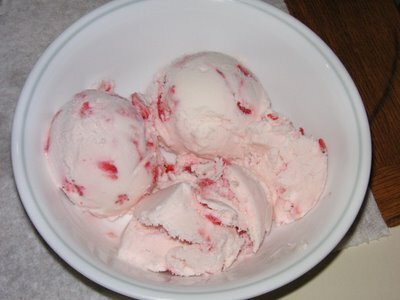 Following the recipe that came with my ice cream maker, I decided to try and make some strawberry ice cream. 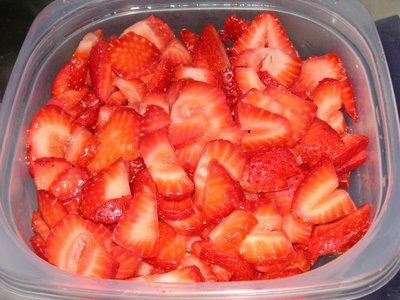 Here I have a pint of sliced strawberries, macerated for 2 hours in 3 tablespoons of freshly squeezed lemon juice, and 1/3 cup of sugar. 1 cup of milk and 2 cups of heavy cream are first mixed with 1 teaspoon of pure vanilla extract, 2/3 cup of sugar, and all the lemon/strawberry juice used for maceration. 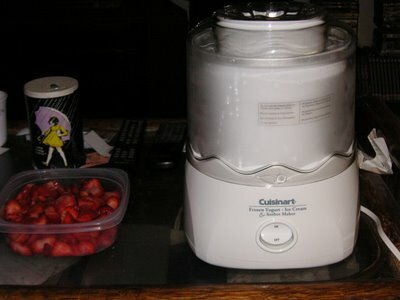 Churn away, ice cream maker! It says to add the strawberries in the final five minutes. 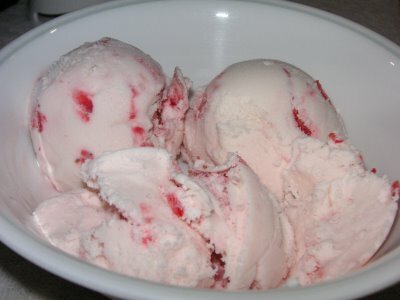 The whole process is supposed to take around 25-35 minutes, so I was just waiting for the 25 minute mark, and checking the consistency of the churn, to pour in the strawberry. Unfortunately, it seems the recipe they had yielded too much ice cream--the machine can only hold 1 1/2 quart of ice cream total. That means 3 pints. Or 6 cups. 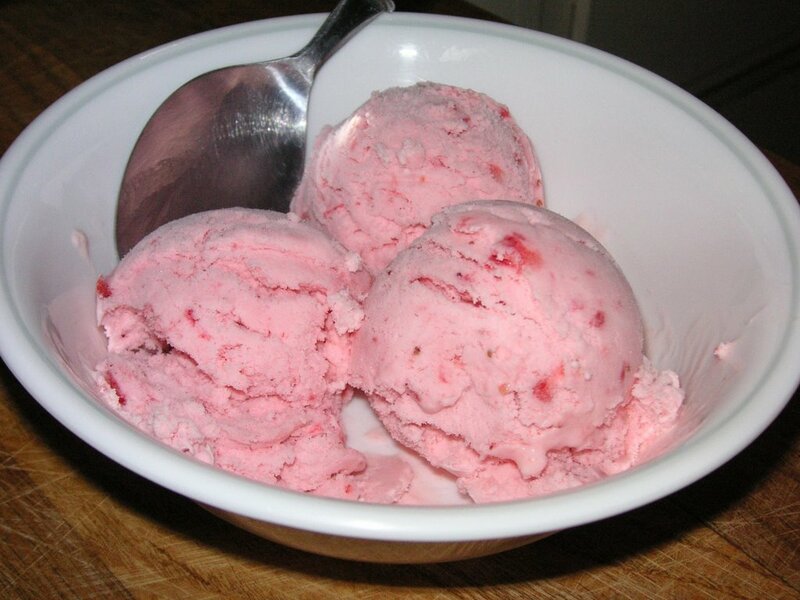 The process of making ice cream means that as your mixture freezes, the churning adds air and keeps it from becoming large chunks of ice, so as air is added, the mixture increases in size (anywhere between 25% to 100%). So we've got 1 cup of sugar + 2 cups heavy cream + 1 cup milk + 1 pint (aka 2 cups) strawberry. That's already 6 cups! There's still the extra lemon juice and air unaccounted for! WTF *&^#)*%! This means that my mixture would overflow when I tried to add the strawberry, and it wouldn't get to the "soft serve" consistency I needed before I put the whole thing in the freezer to set. What does that mean, in the end? Well, it tastes pretty good, but the texture is not consistent. Parts of it is soft, while others are hard. And the strawberry is not as evenly distributed as I'd like them to be. Otherwise, it's not too bad. I suppose I can always eat away 1/3 of it first, melt it down, then re-churn the thing. Next time, I'll decrease the amount of strawberries and milk/cream. That should make for a much more pleasing result.